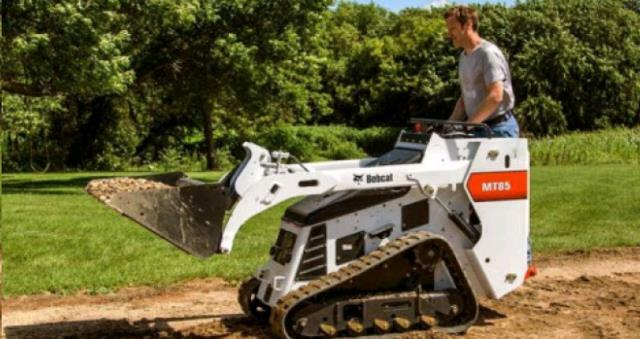 WITH THE BOBCAT MINI TRACK LOADER, AND DIFFERENT ATTACHMENTS, YOU CAN COMPLETE ALL TYPES OF JOBS AROUND YOUR HOME WITH ONLY THIS ONE BOBCAT LOADER MACHINE. BECAUSE IT IS SUCH A COMPACT UNIT AND HIGHLY MANEUVERABLE YOU CAN GO INTO PLACES WHERE MANY MACHINES CAN'T. AND WITH THE RUBBER TRACKS YOU CAN TREAD OVER SOFT, WET GROUND CONDITIONS WITH LITTLE SOIL DISTURBANCE. HEIGHT--55", WIDTH MACHINE-42" WIDTH/BUCKET--44", LENGHT--107"
LIFT HEIGHT TO THE HINGE PIN 80.9"
* Please call us with any questions you may have about our bobcat c mt85 mini loader diesel w/buc in Hamel MN, Plymouth MN and the Twin Cities.